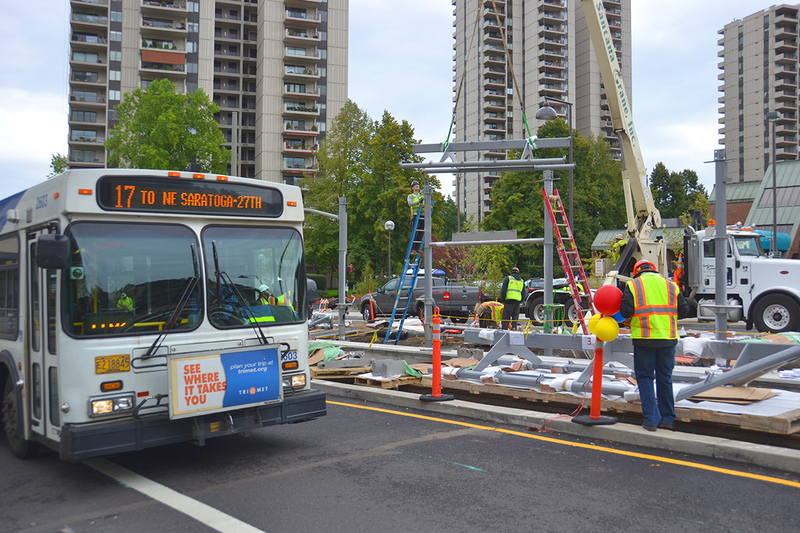 The first MAX station shelter components for the Portland-Milwaukie Light Rail Transit Project are being installed September 23-24 at the Lincoln St/SW 3rd Ave Station in downtown Portland. This is the first phase of shelter installation. Additional shelter features will be added as station construction continues. Portland design firm Mayer Reed simplified the shelter design and detailing, and TriMet worked extensively with fabricator Landscape Forms on refinements related to fabrication and overall quality. Based in Kalamazoo, Michigan, Landscape Forms was selected to fabricate the shelters as a nationally-known metal manufacturing experts. Improvements like stainless steel elements will provide greater aesthetic longevity and reduce maintenance costs. Etched windscreen glass and column mosaics designed by Chicago artist Lynn Basa will enhance the shelters’ appearance and respond conceptually to the surrounding station area. Twenty-one Landscape Forms employees, from engineers to machinists, are fabricating the components and assemblies for 16 shelters that will be installed at project stations. Local manufacturer Bullseye Glass will fabricate the column mosaics. Initial installation includes the basic structural frame of the shelter; the glass roof, wind screen glass, and column mosaics, will be installed at a later date. All project station platforms remain under construction and closed to the public until the project opens on September 12, 2015.